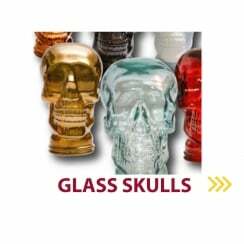 Glass heads and skulls available in a variety of colours all available from stock. Perfect for displaying headphones and hats. The glass heads are also great for sunglasses and standard glasses. If you are looking for a more interesting headphone display or hat stand then 3D Displays may have the answer with their fantastic range of glass heads. A glass display head is a fantastic alternative to a traditional hat stand. They truly are hat stands with a difference. They make a fantastic Virtual Reality headset display. They really add cool and stylish elements to any merchandise display. 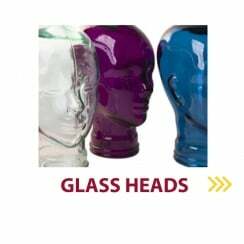 These hugely versatile glass heads made from recycled glass are available as heads or skulls in a variety of colours. Browse the full range of glass heads on the 3D Displays website today. Our recycled glass heads can be used as your store window display or within your store to give it a modern, yet quirky look and feel. It will really make any display stand out and get noticed. Alternatively these glass heads are equally as eye catching when used in the home as a headphone stand or VR headset stand – They will look great by your computer and you will always know where your headset is. If you need your retail display to really stand out this could be the perfect eye-catching display for you. With free delivery on orders over £150, increase your sales by purchasing display equipment from 3D Displays today. For more information about our glass heads and the best ways to use them for display purposes, please feel free to call us on 01795532947. We look forward to hearing from you!